Artist Point sits 5,100 feet above sea level, on a low saddle between the spectacular 10,781-foot Mt. Baker, and the lesser-known, but no less spectacular, 9,131-foot Mt. Shuksan. Among locations reachable via paved road, it is one of the most impressive natural panoramas in North America. But Artist Point remains a bit of a local secret, considering its beauty. Why? It is open maybe 3 months every year, and less on cooler wetter years. This year it opened July 1. In 2012, it opened only July 24 (here's a beautiful photo/video album commemorating the process). 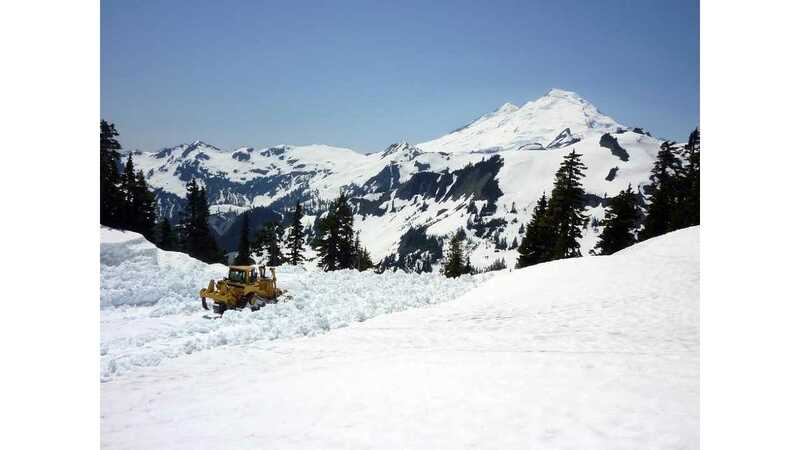 July 2012: clearing the Artist Point parking lot, with Mt. Baker in the background (source: WSDOT). So these are some of the reasons or excuses, why in nearly 12 years in Seattle, we had never made it to Artist Point (we did hike once on the southern slopes of Mt.  Baker, which are approachable from another direction). On the occasion of my sister and her family's visit from Israel - also the first in 12 years - we finally got there last July. And we ended up doing it in our brand-new 2014 Leaf! I kinda realized, as we drove up, that this might be a bit of a big Leaf-bragging deal. Then I had the honor of meeting Tyrel Haveman of 1500-mile fame at this year's Drive Electric Week event, and learned that it's an even bigger deal that I thought! 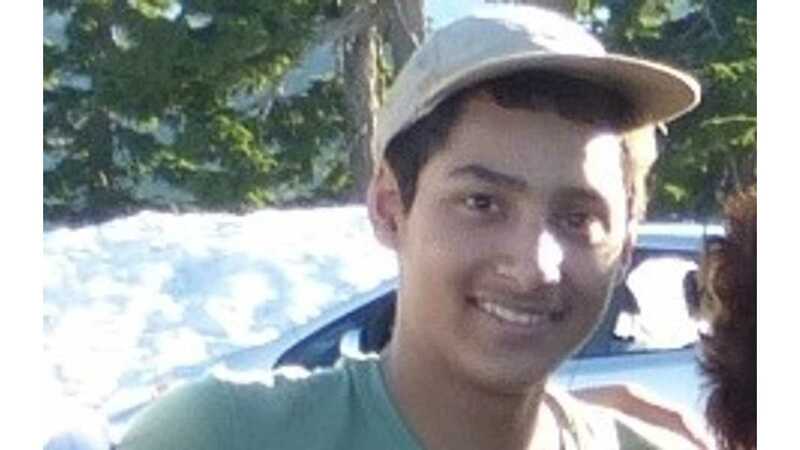 Tyrel lives near Bellingham, the starting point of Mt. Baker Highway. According to him, until this summer only a few Leafs tried to climb the mountain, and had to turn around before reaching Artist Point. What makes the climb challenging besides the steepness and altitude gain, is that charging-wise there's nothing except trickle between Bellingham and Artist Point. 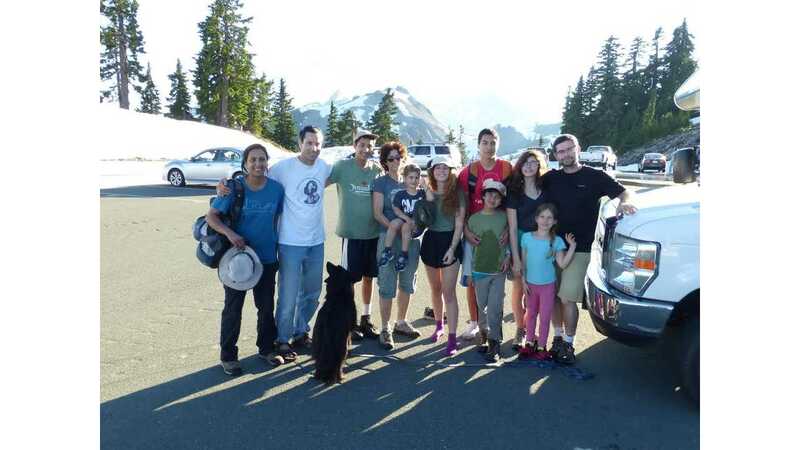 Steve Coram, doubtlessly the Northwest's leading Leaf Lunatic, made it to the Austin Pass visitor center (4400 feet) with his family - within a couple of miles and 700 vertical feet of the destination - but that's where they got the 'Very Low Battery' alert. They too had to turn around, and even needed to trickle-charge on the way back. My sister and brother-in-law had meticulously planned their trip to the US this summer. When you have 4 kids and each round-trip ticket costs... well, a lot, it's an ocean and two continents away... you want to pack all you can into the experience. So, among other things, they pre-ordered a week's rental of a 30-foot RV to go around our beautiful state. This being my wife's busy season, we could not go with them the entire week. Lucky for us: the first two days in Mount Rainier, they got totally rained out, couldn't even see the mountain. Their plan to make a loop east of the mountains was also scuttled by the huge wildfires raging there in July. 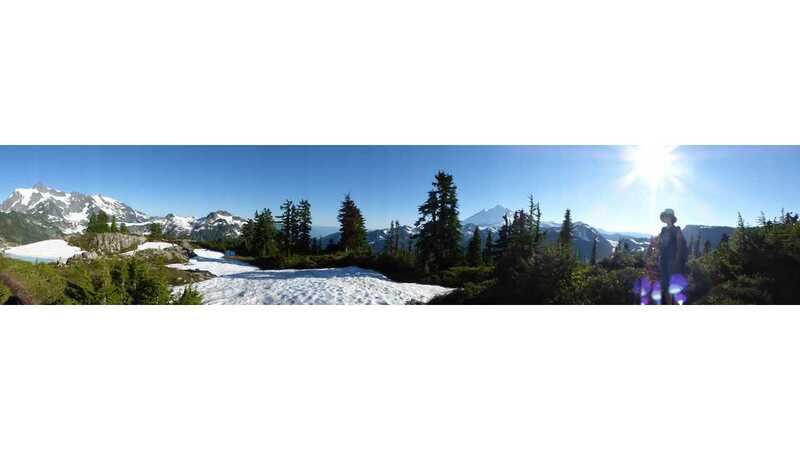 So they inched their way north and visited the North Cascades National Park. We decided to meet them even further north for the final two nights, and use the occasion to finally get to Artist Point. Given that they spent a couple of nights wild-camping without a hookup, I looked for the full-hookup site closest to the mountain. According to our camping Bible, Camping Washington, this was Silver Lake County Park, rated at 4 out of 5 stars. I reserved a full-hookup double site there for two nights. Here's the kicker: at that point we were still planning to leave the Leaf at home. We have another car, a beat-up 2001 Hyundai Santa Fe. Its AC stopped working in 2012. Its "Check Engine Light" is permanently on. Every half-hour or so, it gives off an ominous odor. We stumbled into EV world inadvertently in 2012, looking for something more green to replace that clunker. But then we decided to leave it around, not knowing what life with a Leaf would be like. We use the Santa Fe so little, that in our 2nd Leaf year we put the Santa Fe into "insurance storage", meaning we have to call the insurance company before we want to move it. But we un-stored it for summer 2014, both for our son's driving practice (what's better for practice than a beat-up car that's terrible to drive?) - and for camping. Then we remembered my sister needs to return the RV in Everett, some 2 hours drive from the campground, rather early in the final morning, and find some way to get to Seattle from there. We realized it would be a more pleasant day for all of us, if we bring 2 vehicles along. I checked the distances. With the 2012 Leaf we'd just returned, getting to the Bellingham QC would be a stretch; but according to all specs, the new 2014 we leased should get there, especially now that I knew the trick about taking it easy on the accelerator. We made the decision to take the Leaf only the morning of the trip, or the night before. 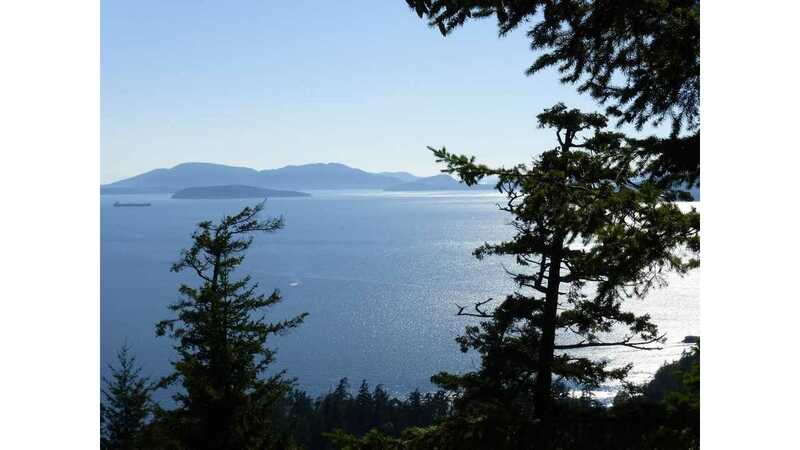 Since we never just drive straight to the campground if we can help it, we planned a hiking trip on the way, whose trailhead is off Chuckanut Drive, a scenic alternative route to Bellingham that goes right on the coast. Before we set out of Seattle the Santa Fe had to fill up on gas. Great, I thought, it will give me a chance to slowpoke the Leaf at 55-60 MPH (thus increasing its range), and she'll catch up to me. But the Santa Fe never caught up to us, we needed to wait for them on Chuckanut Drive. 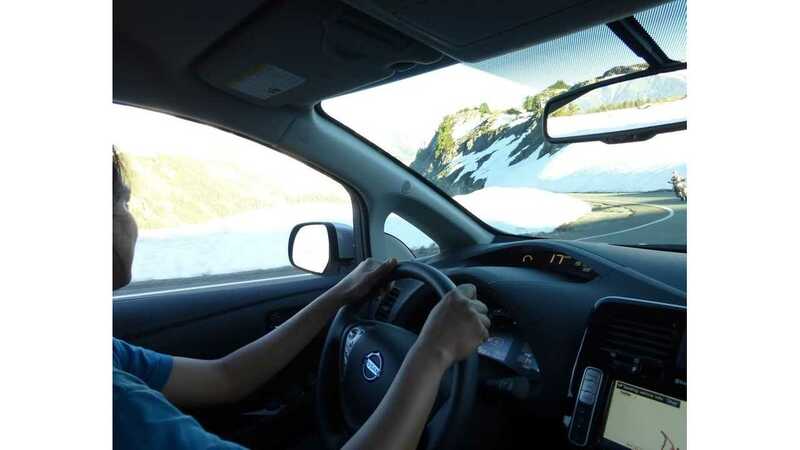 The drive from Bellingham up to Silver Lake was uneventful, except that we used the opportunity (Sunday evening but still daylight, quiet roads) to get our 17-year-old some highway driving experience with the Leaf. We got to Silver Lake with 47% SOC. 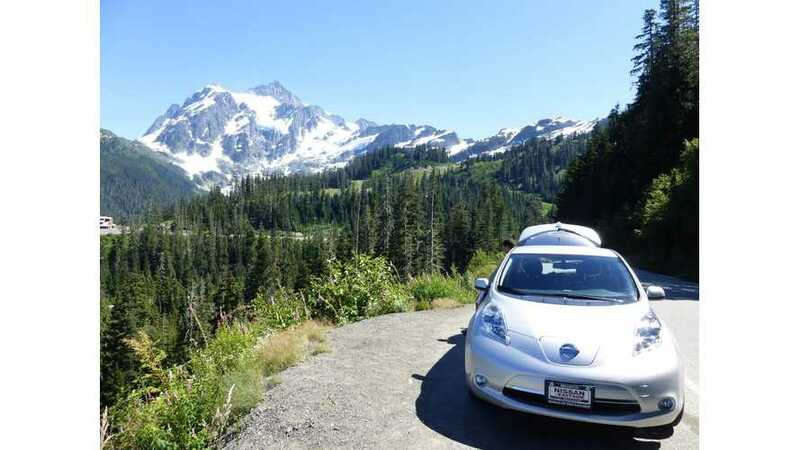 Having seen the 2014 Leaf in action getting to Bellingham, I was confident we can just leave the Santa Fe parking at camp, and take the Leaf up to Mt. Baker the next day. We easily trickled it to 100% overnight. The next day, after canoeing in the lake, we drove towards the mountain. The campground is at 800 feet, but the road meets the main highway at 500 feet. According to that nifty Leaf Range Chart, every 1000 feet of climb takes away one "Bar" or 1/12th of the battery, so with some 4600 feet to climb (from 500 to 5100) we're talking about 35%-40% "vertical charge attrition". The road distance from camp to Artist Point was Googled at 38 miles. We can definitely do 38 miles even on 60% battery, but to do the full 76-mile round trip we'll need some of the battery back via regen. The same Leaf Chart claims at least one-half recuperation on the downhill, which should be enough. But will we get it? We set out with two kids and a dog in back. Despite my big-picture confidence, I was still a bit timid and took it easy on the uphill, occasionally travelling a few MPH slower than other cars and letting them pass us. Ten miles from the end, we were still well above 60% SOC. Then there was a sign about winding steep roads, and the climbing and hairpin-turning began in earnest. Now everyone was going the same speed, except for trucks and motorcycles. Just like the day before with the Santa Fe, my sister's family with the RV had a dump errand before setting out, so we were way ahead of them. As we stopped at a viewpoint to admire Mt. Shuksan (which at this point we had mistaken for Mt. Baker), we could hear them climbing: their engine noise literally filled the ravine. We stopped at Austin Pass, walked the nature trail there and had a picnic lunch. Then, a couple more miles and a 700-foot final climb, and we were at Artist Point. Mt. Baker which was hiding throughout the climb, suddenly jumps into sight. The views all around... unbelievable. You literally don't want to leave. We walked the Artist Ridge trail, still mostly snow-covered in late July, then back to the parking lot. We took a commemorative picture... next to the RV, not the Leaf. 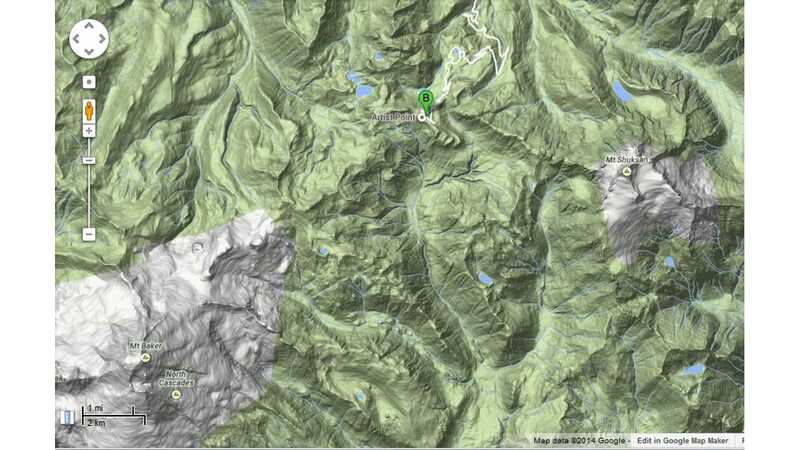 At Artist Point the Leaf was showing 32% SOC, and a scary (though not surprising) 14 miles on the GOM. Coming down (with ECO on and the gear in B), we gained a very healthy additional 16% over the first 10 steep miles. Steve Coram in his Baker blog post, reported gaining only 24 GIDs or ~8%. I wonder whether the 2014's regen has been quietly upgraded, or it's just a luck of the draw. We made it back to camp with 34%, driving at normal speeds the whole way; so the entire return trip was "free"! Also, the round trip ended up being 72 miles, and consuming a bit less than 2/3 of the battery, so our full-battery efficiency that day was around 110 miles. And the only thing we did different from ICE driving, was being a few MPH slower along some stretches on the first part of the uphill. Having so much battery left also meant that trickling it back up to 100% for the drive towards Seattle the next day, was again easy. How about Documentation? And... Did We Cheat??? Ok... so far you only have my word that we did it. In typical fashion, I forgot to take a victory shot of a Leaf surrounded by snow banks at the Artist Point parking lot, with Mt. Baker in the background. Ok, I was pulling your leg a bit. Here's an interior shot I did remember to take, about a quarter-mile after starting down. The snow all around very visible; you can also spot the 14-mile GOM on the dashboard. The record-setting question is "Does This Count?" 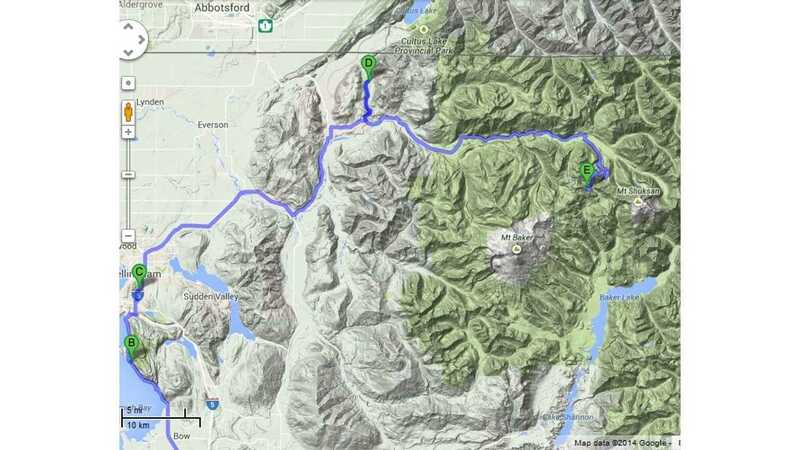 The challenge is apparently stated as Bellingham-Mt. Baker and back. Starting from Silver Lake, we had a 20-25 mile head start compared with starting within Bellingham city limits. But here's the deal. We weren't there to set a record. We were just taking our car, which happened to be a Leaf - and knowing it can do it - on a trip and having a good time. And we found a way in which everyone with a 2013 or newer Leaf can do it. So count it or not, I'm happy either way. 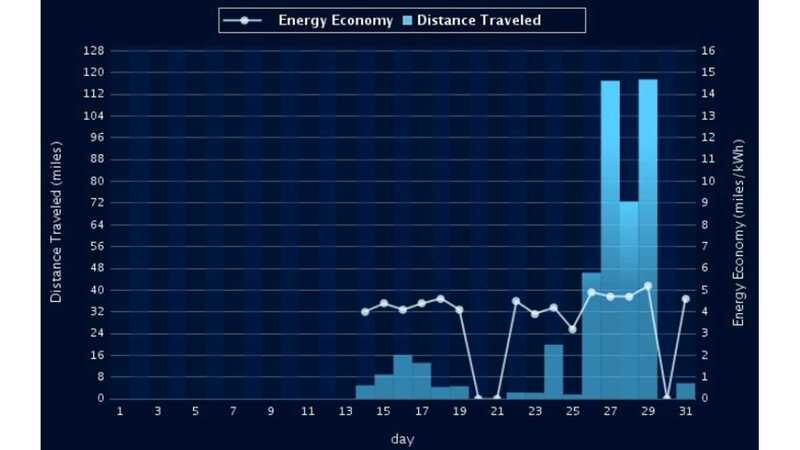 In principle, we could have tried reaching home on a single charge on the final day, and joining the 100-mile club in the process: it's 104 miles from Silver Lake to our home, with a bit of downhill and a lot of side-road driving. But again, this trip wasn't primarily about setting Leaf records. We were taking care of 7 kids that day, and wanted to stop somewhere nice on the way back. So we went into Lake Whatcom for a midday dip (at a place marked 'Park' on the map, which ended up being just a public-access reachable via a rogue footpath; still fun). This added ~10 miles to our trip. Then we needed lunch... which we had at the one restaurant available in the Burlington Outlet complex, which is - you guessed it - where the best-situated QC spot is located. As usual, the Leaf filled up long before we did, and from there it was an easy 60 miles back home. Overall we did a little over 300 miles in 3 days, with two QC stops and two overnight trickle-charging. Our CARWINGS driving history for July 2014. We only got the car on the 12th. The trip was 27th-29th. The nicest thing about doing this trip with the Leaf was, it felt so normal! The Leaf was accompanied by an ICE vehicle the whole time (either the Santa Fe or the RV), but we never held the ICE vehicle back due to charge or range. The bottom line is, just like my previous post about our 2012 Leaf exploits: if you're an ordinary Leaf driver, your Leaf can probably do way more than you think it can. Keep this in mind when you plan trips. In particular, Mt. Baker via Silver Lake is an easy and enjoyable camping trip for families with a Leaf. Thanks to the QC infrastructure along I-5, you can reach this trip from pretty much anywhere in the Pacific Northwest. Maybe we just lucked out on a trip in which all the stars aligned. But I feel there are more and more opportunities like this out there. Someone should start putting together an online book of EV trips, don't you think?